Plan a content burst to get started: I started the Facebook page as I launched a contest on the blog, offering 15 weeks of free online speaker coaching and a Flip HD camcorder . 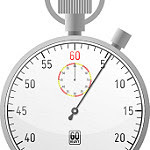 That gave me a month of updates on the contest, including related blog posts and deadline reminders, to get started--plus the updates from the online coaching that followed. As with a blog or Twitter account, planning ahead for regular updates is critical to building (and keeping) an engaged audience. Don't launch the page until you know where the first several weeks of content are coming from. Use the page to build content for your site or blog: A Facebook page is ideal for field-testing your blog or website topics, and crowd-sourcing reactions, responses and tips. Here's a recent example where I asked fans to share their best piece of speaking advice, knowing that most fans like to show what they know as well as learn. This yielded plenty of content for a related blog post, allowing me to let it work more than once. To spark these insights, ask open-ended questions, post articles and ask for reactions, or share your offline updates and activities to get reactions. The result is not only fodder for blog posts, but detailed background on who your audience is. Use built-in page features to engage: Explore and try engaging fans with Facebook's built-in options for pages: discussions, video and photo posts, comments, polls and more. I started several discussions, promoted them on the wall, and kept that tab prominent. 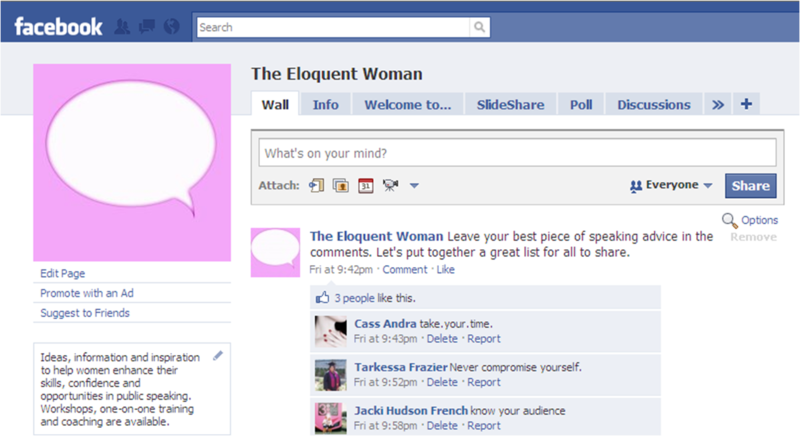 I knew I was on the right track when a new fan started a discussion on how to give her mother's eulogy. I responded, and so did other readers who'd gone through the same thing. She later reported back to us--with my encouragement--on how she did, and on the tips she found most useful. Now that discussion is a permanent resource on the page, and on the blog, where I recreated the discussion for a moving post. Pay attention to your house rules: On occasion, other businesses (and even fans) post promotional material on my page's wall (or in one case, sent messages to all my fans but me) that nearly always prompt complaints. I've got a quick, non-anxious way to turn these around: I remove the post, then message the poster directly and privately to explain that I've done so and that my fans have consistently asked that such messages not be included. In most cases, that works fine. Plan some scheduled content: I've started "Talk to me Tuesdays," a simple effort to ask, every Tuesday, "What's your question about public speaking?" or "what's on your mind about speeches and presentations?" Nearly every week, I get good, basic questions I can answer directly and, often, with pointers to resources on my blog. Here's a recent week's worth of questions, which prompted one fan to say "these are the best threads for concrete speaking advice." Consider whether you're siphoning your own web traffic: You can feed blog updates directly and automatically into a Facebook page, and it's an easy way to go. But sharing your full feed there may mean you're reducing your blog or website's traffic. Facebook's doing a better job reporting page views and other readership statistics, but figure out how (and why) you want to post your web content here, and where you want the readership statistics to count first. Advertise on Facebook with a call to act: Facebook ads are inexpensive, easy to target precisely, and easy to measure. You can set limits on the audience size and reach, and on what you spend daily. I started by advertising the contest with a call for entries, then with ads to encourage readers to join, learn and share insights on speaking. Both approaches yielded fans who've stayed with the page and contributed actively. Once you have a core fan base, be sure to advertise periodically by targeting friends of fans, as your new targets will see whether their friends have already fanned your page. Mark other exits for your Facebook highway: Facebook offers widgets to share your growing fan list in real time on your blog or website, making it easy for fans of your site or blog to join the page. But you need to use all your other options for promoting the page and driving fans there, including reminders and updates in your blog content; taglines at the ends of posts to suggest page participation (and offer links); advertising; and calls to your fans to share the page with their friends, judiciously used. Remember, too, the most organic way to promote your page is with engagement by fans--the more they comment or "like" your posts, the more your page will show up in their feeds where their friends can see it. I'm close to 3,000 fans as of this writing, less than a year in. Some of them will buy my books and speaker-related services, some will refer other business to me, many will just be fans who get something out of the page, but I welcome them all. Will you be one of them? 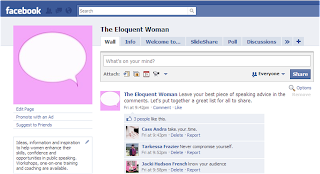 Join us at The Eloquent Woman on Facebook.